WARNING: This article contains comedy science, but genuine hugs. No, really. There aren't enough hugs to go around. We need more hugs. This presents something of a problem. For various reasons, the number of people who can actually deliver a hug is substantially fewer. They can stem from physical limitation, psychological or emotional, but the result is the same. People aren't getting the hugs they need. It's often the case that, when people are in pain, there's little you can do other than be there, even if only in a virtual sense. You can't ever robustly claim that you understand, you can only listen and acknowledge. Empty platitudes are useless, and often exacerbate matters. Advice can be even worse. One thing I've found over many years that's almost universal is the hug. It isn't entirely universal, but it's pretty close, I hope. Even a virtual hug, if conveyed with all the meaning of a physical hug, can have a profound effect on people's sense of well-being. It has to be heartfelt, though. Once we recognised the problem, my crack team of researchers and I shut ourselves away in our top secret research institute - hidden in plain sight, in an unassuming terraced house just off the A6 in Levenshulme - armed only with Heisenberg's Uncertainty Principle, the Schrödinger Equation and the Feynman Path Integral. No expense has been entered into, but I'm sure you will all agree that every penny of it was well spent, as soon as you see the results. We had no idea if there'd be any practical application of what, if anything, we discovered. This was pure Blue Skies research, people! After decades of toil, often in gruelling and horrendous conditions in which we had to deprive ourselves of hugs (and we even cut out the Horlicks for the duration, just on the off-chance that it really is a 'hug in a cup' and that this might skew our observations) for longer and longer periods of time in order to measure the wavefunction out near the Gaussian limits - it was hell, I tell ya - we've had a breakthrough, and it's an entirely practical one. We've rushed to market only hours after our discovery because this is too important not to share straight away. It turns out that, because a virtual hug involves only electrons, its wavefunction can be forced into superposition. This means that, due to sum-over-histories effects that can be calculated using Feynman's approach, these hugs can be everywhere at once! This means that a single hug can hug everybody on the planet at the same time. Initial controlled testing has been pretty positive, and has even revealed some serendipitous effects. It's turns out that there are some weird entanglement phenomena going on. Of course, because of Bell Inequality violations, we know that hidden variables are ruled out, meaning that this entanglement is non-local. The corollary of this is that all possible hugs are transmitted every time a single hug is transmitted, when directed at a single individual even if only by a single individual, results in a dielectric symmetry violation that reverses the polarisation of the field so that one person receives a hug from everybody on the planet all at once. Our research is not yet complete, though, and that's why I'm here attempting to enlist your help. Our results so far indicate that some superfluid effects may be encountered if we can gather sufficient quantum hugs in concert. Our early experiments in this area have been promising, but our resources have taken us as far as we can go for the moment. This is where you come in. 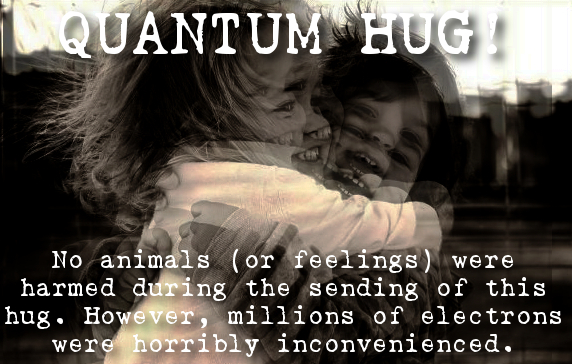 We'd like to conduct an experiment in quantum hugs to see if these effects can be observed. We're not sure of how many volunteers we need to fulfil the requirements of our experimental design, because we're dealing with conjugate variables in very large numbers, so system evolution appears to be subject to chaos. On the first of June, 2018 at 08:00 UTC, we need to gather as many quantum hugs as possible simultaneously. This means we need your help. All we need you to do is to transmit the above image at that time, or by all means devise your own quantum hug. It doesn't need to be directed at somebody in particular, but it doesn't affect the outcome of our experiment if it is, because we have robust procedures for correcting our result for such effects. When you transmit, whether doing so on Twitter, Facebook or other social media, please include the hashtag #QuantumHug so that results can be gathered with the greatest efficacy. It's worth noting that one thing that's been really consistent across all of our experiments is the sense of well-being that's pervaded almost everything we do while we've been experimenting. We predict that this means that, while our experimental data are gathered, a significant number of the people in the world will feel much better, even if only for a few moments. Feel free to conduct your own experiments in the meantime, and transmit this whenever you see a need for it. We may request further participation in the future, as our ultimate aim is to distil the hug to something that neither has to be transmitted nor received via electronic means. It may be that, via quantum tunnelling effects, we can turn the planet into a humongous Esaki diode, meaning that neurotransmitters may be used to transmit quantum hugs directly from brain to brain without passing through the intervening space. As you can see, there's much to be done, and our first experiment is less than two months away. Please help spread the word so that we can gather as many quantum hugs as we can. Research update 14th April 2018: We've had a stunning breakthrough! A few awesome people raised some concerns that our research might be scuppered by the time we've selected to conduct our experiment. They've quite rightly pointed out that 8 am UTC is a bit of an odd time to conduct such an experiment. The date was chosen for two reasons. First, we chose that date in order to honour our wonderful colleagues at CERN, where the Large Hadron Collider is located, because that date is World Doughnut Day, and second because it coincides with 'Say Something Nice' day, so we felt that people would be doubly motivated to get involved. The time is a strange one. In Europe, most will be somewhere between getting out of bed and getting to work, it being a Friday. We chose that time fairly arbitrarily based on the demands of traffic on our servers. Because of the concerns raised, we've conducted some additional testing, and it turns out that we our predictions were rooted in the time-dependent Schrödinger equation. Time does some funny things in quantum phenomena, and this led to some inconsistencies that manifested as a comb-filtering reduction in signal strength, which would have reduced the efficacy of the hugs in concert. We've now reformulated our framework using the time-independent equation, and we've hit upon another serendipitous discovery. To cut a long story short, it means that we can gather #QuantumHug data for any specified time period and the net effect will be identical to them all having been sent at once in the time-dependent formalism. It means that we can leave our detectors open for 24 hours, meaning that we have a much better chance of accumulating sufficient event data to achieve Bose-Einstein condensate of Quantum Hugs. So we will be collecting data from 8 am UTC on the 1st of June until 8 am UTC on the 2nd of June. If you know of anybody who's already joining in and has seen this, please let them know. This has ballooned into a 24 hour extravaganza live stream.